You only have to link your cartridges using one of the above methods. If you link via Cricut Craft Room or Design Space those carts will automatically be available in both programs. If, however, you link your cartridges using a Gypsy there is an extra step you need to do to make them available in Cricut Craft Room and Cricut Design Space. This step can only be done using Cricut Craft Room. You have two choices at this point. 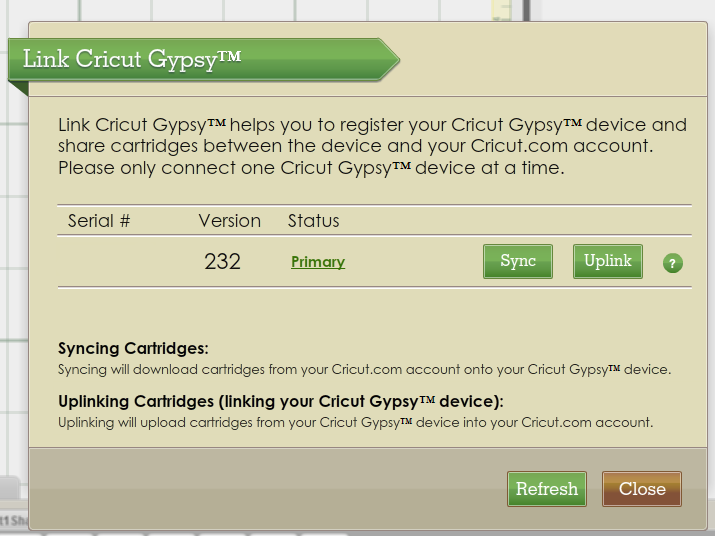 If you want to upload the cartridges from your Gypsy so they are available in Cricut Craft Room and Design Space click the Uplink button. If you want to download the cartridges that are linked to your cricut.com account so they are available on your Gypsy press the Sync button. If you need to do both (because you have some carts linked to your Gypsy and some to your cricut.com account) it doesn't matter which order you do them in. Once everything is up to date, it's easier to select one method of linking any future cartridges (Gypsy vs CCR vs CDS). You'll then only have to do one of the above syncing methods instead of both. Remember... linking is permanent! Once a cartridge is linked to your account (regardless of which method you chose) it cannot be unlinked or linked to another account. This is all greek to me, so maybe if i tell you my situation you can help me. I am about to purchase a gypsy from a crafting friend. She's selling it to me with 29 linked cartridges. I will not get the physical cartridges with the deal, just access to them through the Gypsy. I have an Expression and personal cricut. And I'm not familiar with the Craft room. Will I be able to use all of the cartridges on my new Gypsy, personally and also on the craft room? Thank you for your help! Kim, you'll be able to use them by connecting the Gypsy to your Expression. But you won't be able to use them with Cricut Craft Room because those cartridges are linked to your friends cricut account. Hello, I am about to buy a couple of used cartridges that have already been linked. I am not much of a computer user when it comes to crafts. Would I still need able to use the linked cartridges with my cricut machine alone? Bess, only if you have a Cricut Expression or earlier machine. You can't use cartridges that have been linked to someone else's Cricut account if you have a Cricut Explore. If that's the machine you have, then don't buy those cartridges! I just bought a Cricut Create machine. If I buy a used cartridge on ebay that says it has been linked, will it work on my machine? Eva, yes. Only the Explore won't work with cartridges linked to someone else's Cricut account. But if you ever purchase an Explore those cartridges won't work in it. I linked all my cartridges to my new Cricut. Will the cartridges still work in the Cricut Expression? I have a Create, jjust purchased a used Expression, and am considering purchasing 20 linked cartridges from eBay. Will the linked cartridges work with both/either of my machines? Also, I've never used the craft room...can I use them in the craft room? Yes, the linked cartridges will work with both the machines and also in Cricut Craft Room. You won't be able to link the cartridges to your Cricut account as they are linked to the original owners account. You will be prompted in Cricut Craft Room to insert the cartridge into the Cricut each time you go to cut. If you ever purchase a Cricut Explore (the latest Cricut model) you won't be able to use those cartridges with that machine as it can only cut from cartridges that are linked to your account. I have a Cricut Expression (1). I have over 40 cartridges. I have linked them to my GYPSY, but have NOT linked them through the Gypsy to Craft Room or Design Space. The cartridges are "registered" to my account with Cricut. If a person buys one of my cartridges, can it be linked to THEIR account so THEY can use it in Craft Room or Design Space through THEIR machine? Can it be used on the Explore? 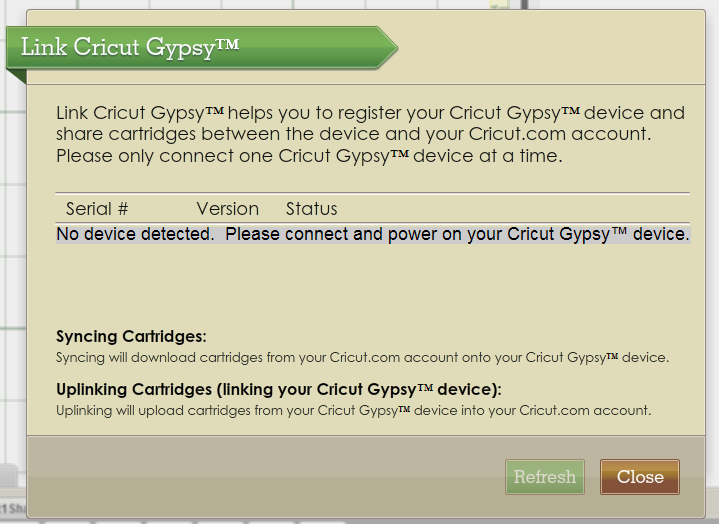 When you linked the cartridges to your Gypsy you linked them to your Cricut account. Cartridges cannot be unlinked. That means that no one else can link them to their Cricut account. If you purchase an Explore you will be able to use those cartridges, but no-one else can. As I commented above once you link a cartridge to your Cricut account (which you did when you linked them to your Gypsy) they can not be linked to anyone else's Cricut account. They will work in any future Cricut (Explore or Maker) you purchase provided you link your Gypsy to your Cricut account. The instructions to do that are in this post. Remember, you don't link your cartridges to a particular Cricut machine. You link them to your Cricut account. Regardless of how you link your cartridges it is against the Cricut EULA to sell or give those cartridges away. That's like buying a music CD, saving the songs to your computer then selling the CD. If I purchase used linked cartridges I can use them on my Cricut Expression Machine? Yes, linked cartridges work in the Cricut Expression. If you're using CCR you'll be prompted to insert each cart before it will cut. If you're using the Expression as a standalone, just insert the cart when you want to cut. That's correct, Cartridges can only be linked to one persons Cricut account. And as the Gypsy technology is so old I would hesitate about buying one. Also remember that thenGyosy can't be used with the Cricut Explore or Maker. Narelle thanks for answering I have one other question so if I use cricut craftroom with a linked cartridges that aren't in my craftroom account will I be able to cut with that cartridge? I ask this because I ask a cricut.com representative via chat and he told me no it would request me to purchase the cartridge so I was confused? I brought a cricut mini. Can i get used cartridges? Yes. Any Cricut prior to the Explore can use linked Cartridges. I have cartridges that I bought new and linked when I used craft room. Now I have Explore air 2 and noticed tonight that my cartridges are showing up. It keeps prompting me to buy the images I was trying to cut. Even with the cartridge in the machine! What could be wrong? Yes, it is against their policy. attempt to sell, rent, lease, or transfer, the Cartridge or Content or any portion thereof (including operating a software‐as‐service, application service provider, service bureau or equivalent service using the Cartridge or Content to any other person, without the prior express written permission of Provo Craft) in any manner whatsoever. " It doesn't specify linked or unlinked. Mainly (in my opinion) because this was written before the ability to link cartridges to an account was even possible. Hope that helps. If you need more info I would suggest giving Cricut customer service a call. Hi, I'm new to cricut world, but I love it! Anyway so a few months ago I bought a cricut expressions 2 from an online ad, it was used and just recently I upgraded to the cricut maker (such an awesome machine!) But for some reason the cartridges that I purchased new won't link thru the expression it shows as a cartridge that has been linked before when I try and press on it for it to cut it won't do it cuz it says I need the cartridge when I place it won't read it. I guess the person that owned the expressions machine before had all her cartridges linked that now the machine doesn't read mine. And I can't link thru the cricut maker because it doesn't have that feature, what can I do? I'm guessing you're using Cricut craft room with your Expression 2 to link your cartridges. If they were purchased new there shouldn't be a problem linking them. Cartridges are linked to a Cricut account not a machine so it doesn't matter that your E2 was purchased used. In the meantime I would suggest you contact Cricut customer service. They can help get your cartridges linked to your account. They may need a photo of the front and back of the cartridges. Narelle - thank you for all the wisdom. I have a Cricut Explorer. I have about 20 linked cartridges and I want to give my machine to a friend to use as I no longer use it very much. The consumables (mats, pens, especially blades) are so expensive and need constant replacement. Guess I did not think of that when I purchased it. Anyway, since the Explorer is hooked to my Cricut account and the cartridges are as well, can my friend use my machine and cartridges with her Cricut account? I need some advice please. I have a personal machine and the explore with the wifi adapter. I linked all my carts (several) to my gypsy and they show on my cricut account. I would like to sell everything and I am not sure how to cancel my cricut account or transfer it to whoever might buy it. I just don't want someone to get my personal info and use it to make any purchases using my info. Any help is appreciated. Thank you. You won't be able to cancel your cricut account without contacting Cricut customer service. I'm not sure whether they will transfer everything over to whoever purchases your Explore. I haven't heard of them doing that though. You can't edit your email address at cricut.com so if you're tempted to give the buyer your cricut account details I would ensure that any credit card details are removed. I'd also see if you can remove your default address details. Giving someone else access to your cricut account is quite possibly against the Cricut end user license though. My advice would be to contact Cricut CS. Ok so I just purchased a gypsy with so many cartrideges on it but it is not working on my expression but the ones that I link do work. Can I not use the ones that are already on it. Judy, did you connect the Gypsy to Cricut Sync at some point? If you did it's possible you've word the carts that we're previously linked to the Gypsy. That's one of the risks of buying a used Gypsy. I'm trying to find out more info for you on this question though. Are the originally linked carts showing up in black on the list of carts on the Gypsy? Yes, she will be able to use those cartridges directly in the Expression. She will also be able to use them with Cricut Craft Room. She won't be able to link them to her account but CCR will prompt her to insert the cartridges each time before cutting. Hi I am getting a cricut expression and am buying a preloaded gypsey on ebay. Will I have to update my expression or the gypsey to be able to cut? 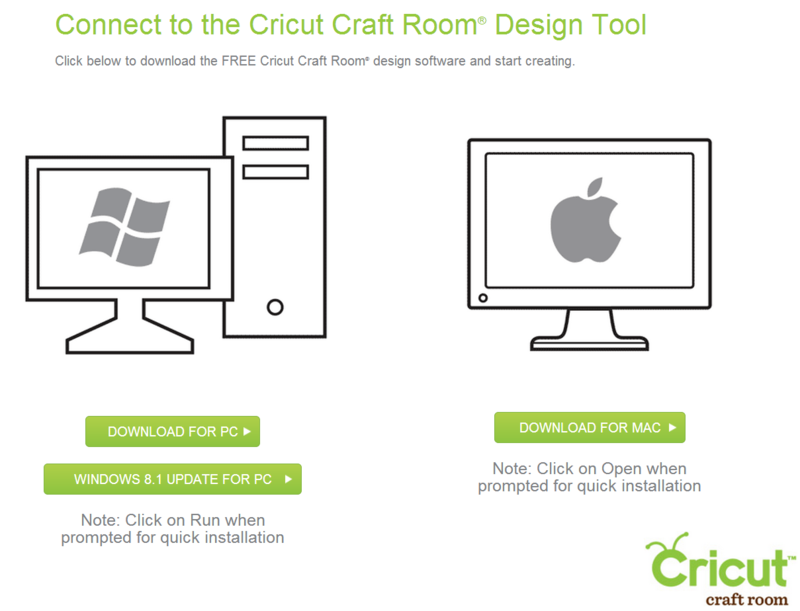 Or do I have to have cricut craftroom to use it? All I want to do is put the gypsey in and pick an image and cut. I don't care about having it on a craftroom account.what exactly should I for sure not do? Don't update the gypsy. Those cartridges are registered to the original owners Cricut account. If you update it all the cartridges will be deleted. The Expression might need to be updated. It really depends on what firmware is installed on it. The latest firmware version is 2.43. The firmware version is shown on the screen which you switch it on. Be aware you're buying outdated technology. There haven't been any updates to the Expression or Gypsy for many years.